Size: 5.7" x 2.8" x 0.45"
The TI-30Xa SOLAR added to the earlier TI-30X SOLAR a Constant-key (above the HYP-key). Within two years the housing got a smoother design. View the new TI-30Xa Solar here. The internal construction of the TI-30Xa SOLAR is identical with the original TI-30X SOLAR but instead of a Toshiba T6M38 single-chip calculator circuit it makes use of the T6M79. Read more about the Logarithm Bug and its side effect on the related yx function present in this calculator. 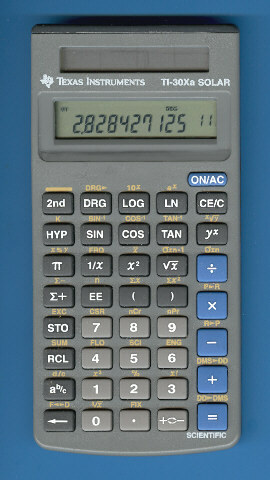 A more robust version was introduced with the TI-30Xa SE (School Edition).